The French City Society, members pictured, raised $6,300 during the group’s January 2019 meeting. From left, French City Society Founder, Paula Williams-Wray; FCS Advisory Team Member, Christi Johnson and Co-Founder, Elisha Meadows-Biland. 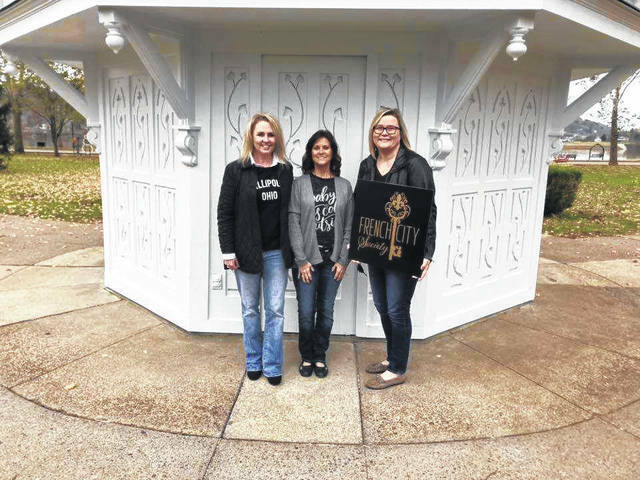 GALLIPOLIS — Since its formation in October 2018, the French City Society has donated over $11,000 to local non-profits with $5,600 going to Serenity House in October and $6,300 to the French Art Colony in January. 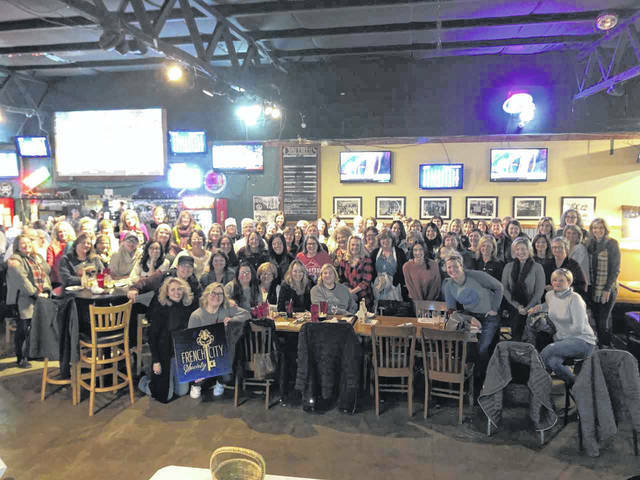 The idea to form FCS came about after founder Paula Williams-Wray attended a 100 Women of Westerville gathering, a community-minded group based on the concept of getting 100 women together for one hour, each donating $100, resulting in $10,000 donated to a local charity/non-profit. Inspired by the organization’s efforts, Williams-Wray reached out to close friend Elisha Meadows-Biland and the duo officially formed the French City Society. They launched a website, designed a logo, secured the first meeting location and began promoting the idea – an organization that funds its donations through direct pledges from members, as opposed to holding fundraisers. The immediate response and support, especially from those both women had served with in the past, was overwhelming. FCS gathers four times a year, currently at Courtside on Second Avenue in Gallipolis, where Williams-Wray said Paul and Chelsea Covey have gone above and beyond to accommodate and support their organization. The evening includes a social hour and registration time, followed by the meeting, which typically lasts about an hour. During the meeting, the recipient of the prior quarter’s donation shares with the group how the funds helped their organization, then selection of that quarter’s recipient begins. Members nominate charities by writing its name on a card and dropping it in a basket. Then, three cards are chosen at random. The three members whose cards are chosen are given five minutes each to present about their nominated charity, followed by a five-minute question and answer session. Members then vote on one of those three charities, again writing the name on a voting card. The cards are collected, counted and the winning nomination for that evening is announced. Members then write their checks directly to that charity and FCS organizers deliver the donation to the chosen organization. It was this set-up that inspired Williams-Wray to form the organization in Gallia County, having seen a need to give the community a way to give back that didn’t involve a significant time commitment. The response has been huge, said Williams-Wray, with 56 individuals or teams joining the first meeting. The ultimate goal for the organization is a donation of $10,000 each round, for a total of $40,000 a year donated to local charities. This would require 100 individuals or teams to commit to the $100 each quarter. And FCS is well on its way to that goal, with 18 individual members, 10 teams of two and 36 teams of four already committed. The next meeting of FCS is planned for April 2019. In order to join, committed members must be 18 years of age or older and have a checking account, as the group does not accept cash. Members can either join as an individual, committing to $100 each quarter, or teams of two or four can join and donate $50 each per meeting for the former or $25 for the latter, for a total of $100 per team. The group expects to donate at least $6,400 to an organization in April. FCS is now listed as an Ohio chapter on the national website of 100 Who Care Alliance representing Gallia County. You can follow them on Facebook or visit their website at https://frenchcitysociety.wordpress.com. To join, you can either download the form from the website or pick one up at Lucky Cat Design Co. on Second Avenue. Once the form is completed and signed, either drop it off at Lucky Cat Design Co. or email it to frenchcitysociety@gmail.com.